Anemone is a genus of about 120 species of flowering plants in the buttercup family Ranunculaceae in the north and south temperate zones. According to the Oxford English Dictionary, Greek anemōnē means "daughter of the wind", from ánemos "wind" + feminine patronymic suffix -ōnē, and roughly means wind flower, which signifies that the wind that blows the petal open will also, eventually, blow the dead petals away. But others suggest that this is a folk etymology, and that the word actually comes from a Semitic language. 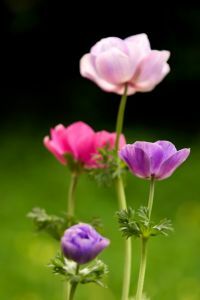 Anemone are perennials that have basal leaves with long leaf-stems that can be upright or prostrate. Leaves are simple or compound with lobed, parted, or undivided leaf blades. The leaf margins are toothed or entire. The flowers with 4-27 sepals are produced singly, in cymes of 2-9 flowers, or in umbels, above a cluster of leaf- or sepal-like bracts. Sepals may be any color. They are bisexual 10 to 200 stamens and many simple pistils. The pistils have one ovule. The flowers have nectaries, but petals are missing in the majority of species. The fruits are ovoid to obovoid shaped achenes that are collected together in a tight cluster, ending variously lengthened stalks; though many species have sessile clusters terminating the stems. The achenes are beaked and some species have feathery hairs attached to them. Many of the anemone species are favorite garden plants, particularly since the different species can provide flowers throughout the year. Of the late spring bulbs, A. blanda is one of the most common, and is often sold as a mixture of colours, although purple predominates. 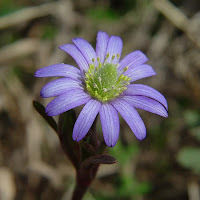 The genus contains many other spring-flowering plants, of which A. hortensis and A. fulgens have less divided leaves and splendid rosy-purple or scarlet flowers. They require similar treatment. Among the best known summer anemone is Anemone coronaria, often called the poppy anemone, a tuberous-rooted plant, with parsleylike divided leaves, and large showy poppylike blossoms on stalks of from 15–20 cm high; the flowers are of various colours, but the principal are scarlet, crimson, blue, purple, and white. There are also double-flowered varieties, in which the stamens in the centre are replaced by a tuft of narrow petals. It is an old garden favourite, and of the double forms there are named varieties. Anemone hupehensis, and its white cultivar 'Honorine Joubert', the latter especially, are amongst the finest of autumn-flowering hardy perennials; they grow well in light soil, and reach 60–100 cm in height, blooming continually for several weeks. A group of dwarf species, represented by the native British A. nemorosa and A. apennina, are amongst the most beautiful of spring flowers for planting in woods and shady places. 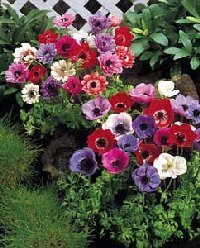 Anemones grow best in a loamy soil, enriched with well-rotted manure, which should be dug in below the tubers. These may be planted in October, and for succession in January, the autumn-planted ones being protected by a covering of leaves or short stable litter. They will flower in May and June, and when the leaves have ripened should be taken up into a dry room till planting time. They are easily raised from the seed, and a bed of the single varieties is a valuable addition to a flower-garden, as it affords, in a warm situation, an abundance of handsome and often brilliant spring flowers, almost as early as the snowdrop or crocus. Anemone thrives in partial shade, or in full sun provided they are shielded from the hottest sun in southern areas. A well-drained slightly acid soil, enriched with compost, is ideal. It is best to harvest cut flowers early in the morning while it is still cold out side while the bloom is still closed. To open your flowers place in room temperature water out of direct sun. 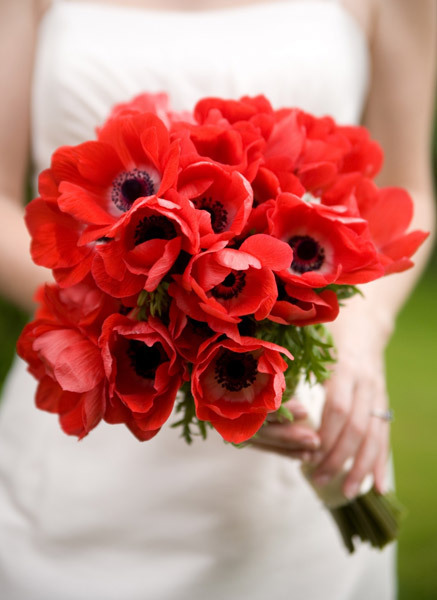 Anemones are a great cut flower and will give you around nine days of vase life when properly cared for. 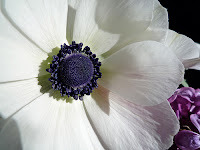 Anemone blooms can be purchased from a florist between November and June depending upon availability.